Hannah Stonehouse Hudson is sitting on a stool, hunched over a hole in the ice on Lake Superior near Washburn, Wis. The ice here, about a half mile from shore, is 9 inches thick, a cool greenish color, and every so often, it shifts and moves, making wild noises. "It's just the booms or the cracks or the growls — or any of whatever you want to call it — of Lake Superior," she said. 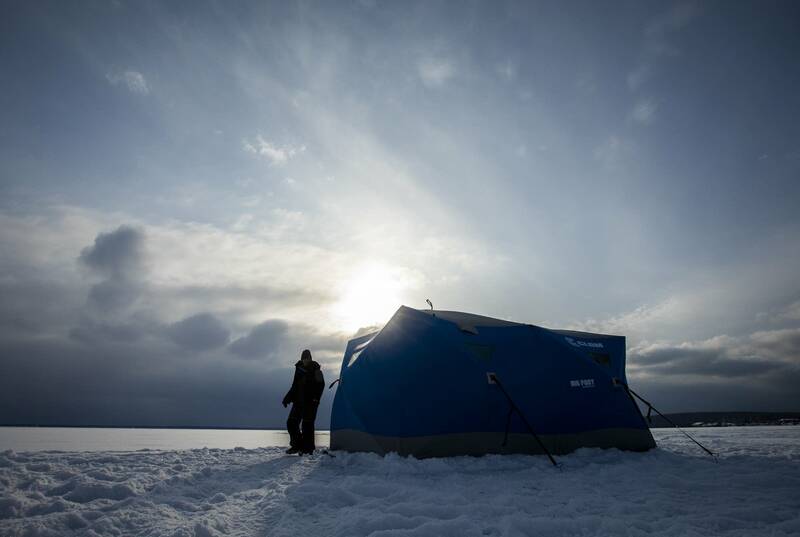 But it took her a while to get to this point — to the point where she's comfortable ice fishing here on the lake. Six winters ago, her husband, Jim Hudson, fell through this ice. He was a fishing guide. He'd been working. "He was just in a bad spot," she said. "He went to a spot where there was ice before. And his snowmobile went in and they tried to get him out. And it didn't work." Jim Hudson was under the water for about 45 minutes, not far from the spot where his wife is set up on the ice. It's her first time back here, fishing, since that day. She's here as part of a women's ice fishing group — the Women Ice Angler Project. 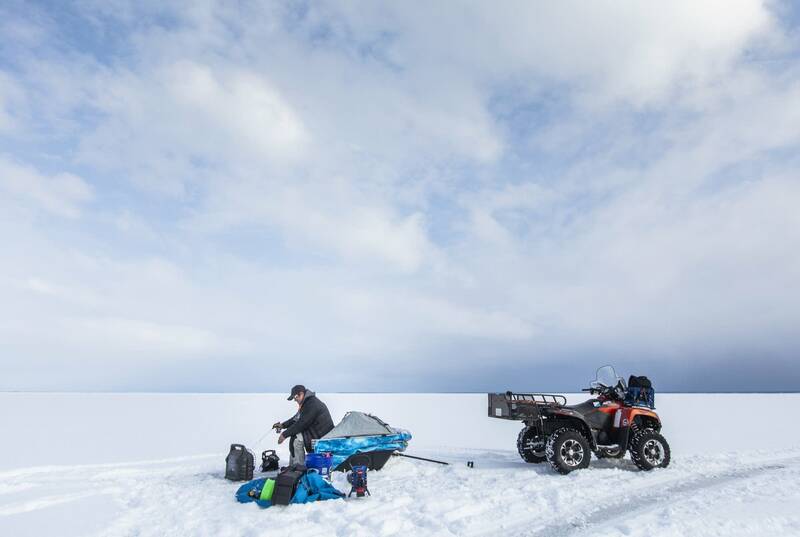 Every winter since 2015, they've gathered on a different lake to fish. Hannah had always enjoyed fishing. It was what immediately connected her to Jim the first time they met — 15 years ago at a bar in Superior, Wis.
"Somehow within the first couple of seconds, we got into a conversation about fishing and he said, 'You like to fish?'" she said. "His eyes got huge!" Within two months Hannah had bought Jim a fishing boat. A year later, they got married. It was Jim who taught Hannah to ice fish. He taught her about Lake Superior and about things he learned from his grandfather when he was growing up on the Red Cliff Reservation, just north of Bayfield, Wis.
"When you saw him out here, you realized how he was just part of this lake," she said. "He knew where stuff was, he knew where fish were, he knew the weather systems, he knew everything about it. And I feel really lucky to have been taught that by him." Jim spent a lot of his time on the lake. He ran a successful fishing guide business. And Hannah was a photographer. In the summer of 2012, she took a picture of a friend, standing on Lake Superior, cradling his elderly, dying dog in his arms. It went viral on the internet. "My life turned completely upside down," she said. "I was traveling all over the place." She started taking pictures of other people's dogs. And random people began showing up at her house, unannounced. "Not even knocking," she said, "and then they're crying, they're standing in my kitchen, crying, talking about how the photo made them feel love and then telling stories about their lives." It was overwhelming and surprising and sweet all at once, she said. Then, about six months later when Hannah was still riding the high of that photo, Jim woke up early on a cold January morning to take some clients ice fishing. He kissed Hannah goodbye. A few hours later, she got a frantic call from a number she didn't recognize. Jim had gone through the ice. Immediately after he died, Hannah started going for runs, every day, on the ice on Lake Superior not far from their house in Bayfield. She was not going to be afraid of the ice, she told herself. She was not going to be afraid of the lake her husband loved so much. But it took her a longer time to go ice fishing again. 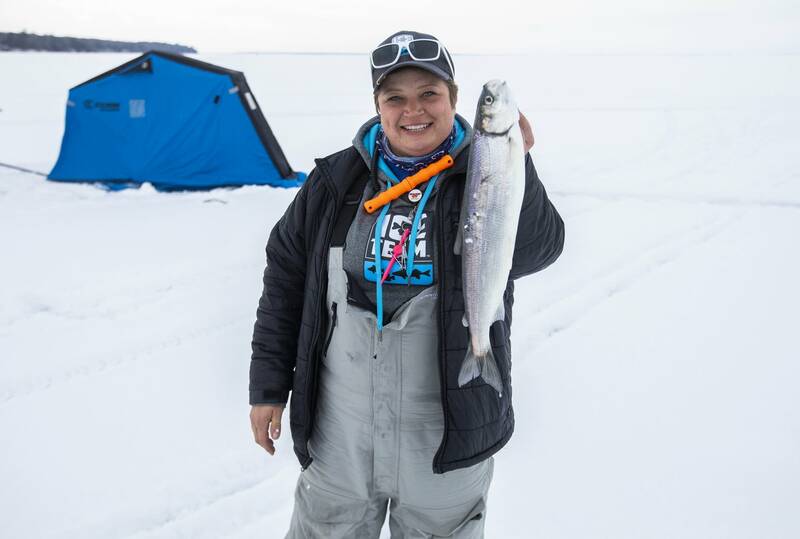 The winter after Jim died, Hannah's friend Barb Carey approached her with an idea: to organize an event that would promote and celebrate the growing number of women who ice fish. Carey is a fishing guide who founded a group called Wisconsin Women Fish. She knew that Hannah loved fishing. And she knew that women are a growing demographic in the ice fishing world. But the industry wasn't paying attention. "There [are] no photos of women anywhere in catalogs, in any print media marketing materials, nothing," she said. 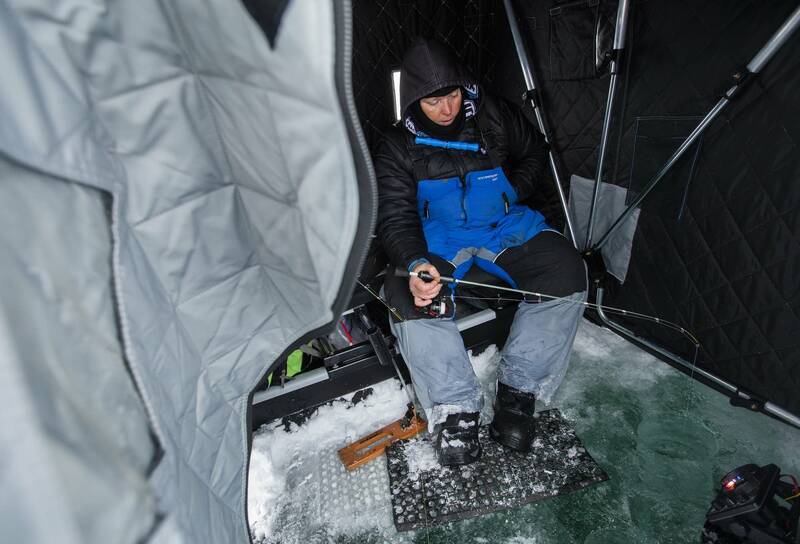 "It's just like women don't exist in the ice fishing world." So, together, they created the Women Ice Angler Project. Hannah became the group's official photographer. 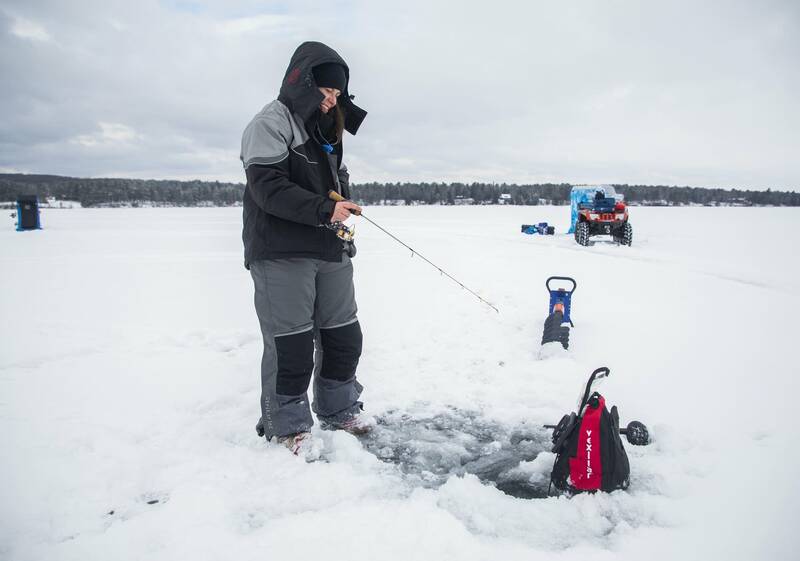 That first winter, they fished on Lake of the Woods in far northern Minnesota. Hannah had a tough time out there on the ice. "I was bawling my eyes out," she said. "Not because I was afraid. Because it was the first time I ever fished without Jim." But since then, Hannah has fished every winter on several different lakes with a new community of women anglers. And as the project has grown, it's become about something much bigger than fishing, said Carey. "Because I see how women's lives are changed," she said. "I see how all of a sudden they're backing their boat in, they're going fishing, they have confidence and pride in doing things they never thought they could do." And on Saturday — the sixth anniversary of the day Jim Hudson died — his wife will be on the ice again, with 50 women fishing on the big lake. And Hannah Stonehouse Hudson isn't scared to be back. And she's not sad. "To be perfectly honest, I didn't know how I'd react," she said. "I didn't realize how happy I'd be, [how] joyful — and know this is where I'm supposed to be." And now she says she gets to share that gift with other women on the lake she loves. "Ice fishing did not kill [Jim]," she said. "He gave that to me as a gift. He gave his knowledge of Lake Superior to me as a gift. And I am never going to give that up."